FUNDAMENTAL SCHOOL developed and realized the interior of an exhibition space at 5 Höfe Munich with a focus on indoor air quality. FUNDAMENTAL SCHOOL developed a detox hand-printed wallpaper according to the Cradle to Cradle Material Health Design Protocol. All components and chemicals of the wallpaper were selected and screened on human health criteria: paper, binders and pigments. According to the UmweltBundesAmt, Germany’s main environmental protection agency people spend two-thirds of their time indoor. Not always, however, the indoor air has a quality that is beneficial to human health. Numerous sources may affect the quality of indoor air adversely affected by pollutant emissions. Furniture, construction materials, finishing etc. continuously emit chemicals. Developing healthy products and construction materials is key to improve indoor air quality and human health. 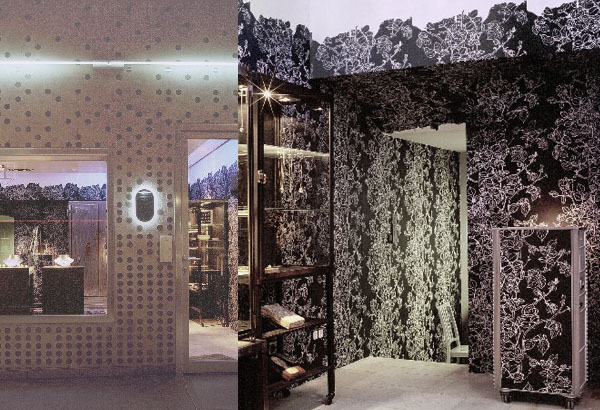 The wallpaper was printed with technically pure carbon black and white mineral. Especially pigments are relevant as these may contain heavy metals and halogenated compounds, both known for negative environmental impacts.